Sweet and Airy Baked Meringue Rosettes are spiked with Tart and Fruity Raspberry, and Sandwiched around the Silkiest Dark Chocolate Whipped Ganache. You’ll do a double-take when you taste this Confection! They taste even better than they look! Naturally Gluten-Free. Oh boy. Oh wow. Do I have a fabulous Valentines Day treat for you guys today! These babies are ah-mazing, for serious! You have heard me go on and on about my love for Ghirardelli many times before. I evangelize about their unsweetened cocoa powder (here, here, and here) every chance I get. And their baking chips are all I’ll ever use (remember these? ); they are my absolute fave. I just love how easy they make it to really get high quality chocolate. I can always find Ghirardelli at my regular supermarket, and the product is, IMHO, so far superior to other grocery store brands. I picked these little beauties up at Giant; no trip to a specialty food store required! The raspberry meringues are pretty tasty all by themselves, but truly, the 60% cacao baking chips are what take them completely over the top. Have you ever tried the 60% chocolate? The flavor is so incredible. So very dark and intense. They really balance out the sweetness of the meringues. I had a feeling they’d be good when the idea first came to me, but I seriously did a double take when I took that first bite! I was really impressed by how much the raspberry flavor comes through! I never knew you could add preserves to meringue in this way; I always assumed that would cause it to deflate or somehow mess with the delicate chemistry. But it worked like a charm! I got the idea from Better Homes and Gardens. And now I can’t wait to experiment in other ways! Look out pavlova and macarons: I’ve got my eye on you! Also I should mention that a really big pastry bag is perfect for a job like this. I use the 16″ size, and that way I don’t have to keep interrupting my flow to refill the bag. It’s a timesaver! I have the polyester ones, but the disposable plastic is probably even better. If you aren’t really careful about cleaning the reusable ones with soap and super hot water, the residual grease from buttercreams and stuff like that can really mess with egg whites. You are going to love the way that intense, deep dark chocolate plays against the sweet, fruity, light and crisp meringue. First, that delicate confection just crumbles and melts on your tongue, and then the smooth rich chocolate takes over and tempers the sugary sweetness. The contrast is so heavenly! 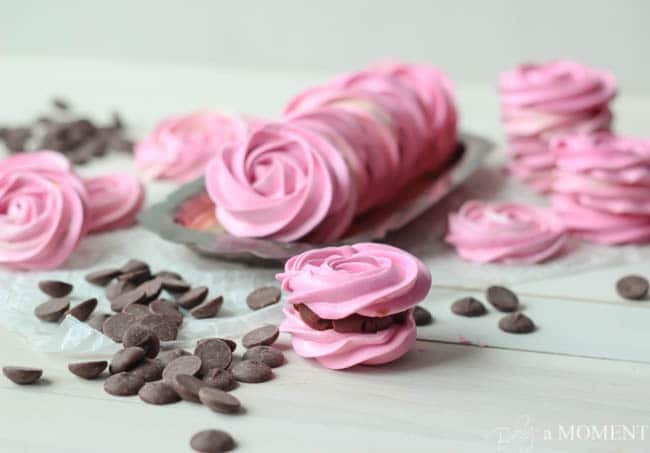 Sweet and Airy Baked Meringue Rosettes are spiked with Tart and Fruity Raspberry, and Sandwiched around the Silkiest Dark Chocolate Whipped Ganache. You'll do a double-take when you taste this Confection! They taste even better than they look! Place the baking chips in a mixing bowl. Heat the cream to simmering, and pour it over the baking chips, all at once. Allow to stand for 3 minutes. Use a wire whisk to stir the cream and chocolate together until smooth and well-combined. Cover, and set aside to cool completely. When the ganache has cooled and solidified, whip it on high speed with an electric mixer until fluffy and spreadable. The consistency should be similar to cake frosting. Gradually, and very slowly, add the sugar, while continuing to whip. Mixture should be very stiff and glossy. Place the jam and food coloring (if using) in a small bowl, and fold about a cup of the meringue in. Transfer the mixture back into the meringue, and fold gently to combine. Pipe rosettes onto parchment lined baking sheets, and bake for 2 hours or until the meringues are very dry and peel off the parchment easily. Pipe or spread about a tablespoon of the whipped ganache over the back sides of half the meringues. Sandwich another meringue rosette on top. Keep in an airtight container. How gorgeous would a box of these look, all wrapped up pretty for your love? Nothing beats chocolate (and pink!) for Valentine’s Day, and it doesn’t get any better than Ghirardelli for baking! Just gorgeous! We’re both supporting Ghirardelli today! 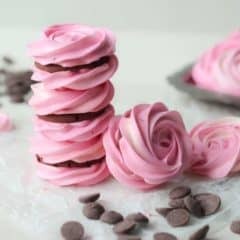 🙂 your raspberry meringue rosettes are just gorgeous!!! love this! have a happy V-day! When do you head out to NYC? Hey Alice, thanks! Yeah I saw that! Your post was gorgeous. Loved it! We decided to hold off a few weeks on NYC because the weather’s just so crappy. We like to walk all over the city and figured it’d be more fun if we waited for things to warm up a little. Happy V Day to you too! I’m planning on making your little bundtlettes with the m&m’s inside for my older one’s class party. I love that idea! So jealous I didn’t think of it, lol…! I may post about it; if I do I’m linking to you! Oh my gosh, Allie….These sandwiches are so gorgeous! 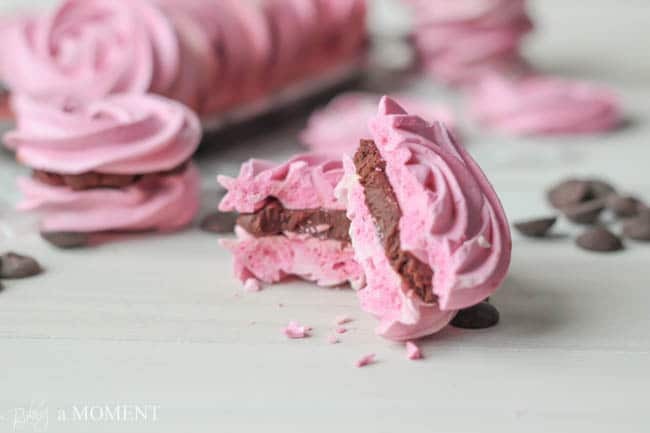 There’s nothing about them that I don’t love—their beautiful rose shape….their pretty pink tint…and that luscious ganache filling…Literally want one (or two) of these right now at only 10 am! So perfect. Pinned! Allie, those meringue rosettes are stunning! You’re baked goods are always so beautiful. They’re just too pretty to eat! You make everything look so ‘rosy’. 🙂 Beautiful and I bet they’re delicious too! Thank you, Melanie! And they are! I really did do a double take, no kidding! Pretttyyy! 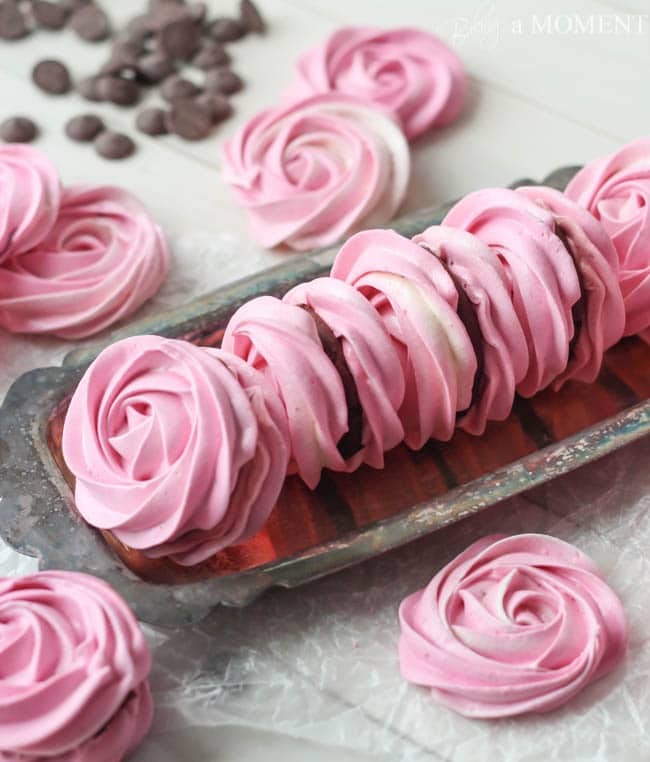 I love the rosette technique, I use it for cakes and cupcakes all the time! These are so gorgeous! I so want to try these! These are gorgeous Allie! 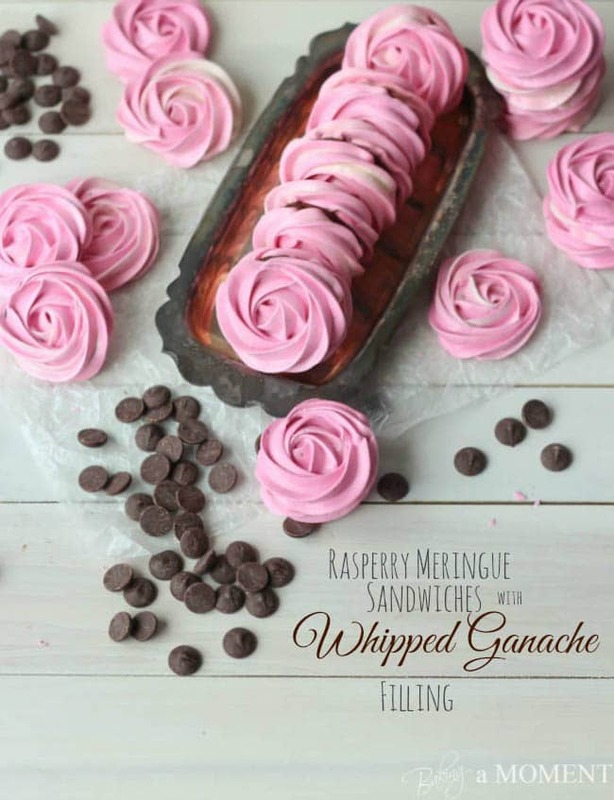 I love the rosette shapes and I didn’t know you could use fruit preserves in meringues either – what an awesome idea! I just made macarons too and will have to try that out for my next batch, thanks for the amazing tip:) Love the raspberry with dark chocolate combo – sounds incredible! Pinning and hope you have a great weekend! Thanks Kelly! I’m so psyched about the preserves- it really worked great! And the flavor came through like whoa. I’m happy to share! Thanks for the sweet comment- hope your weekend is lots of fun! these sound amazing and they are so pretty! Thanks Dina! And don’t forget easy 😉 Hope you’re enjoying your weekend. It’s snowing here! Again! Get here, Spring! Thank you so much, Liz! But the best part is they taste so good! The chocolate really balances out the sweetness, and the raspberry is so fruity! Thanks for the sweet comment; hope you’re enjoying your weekend! What size tip did you use for the roses, please? Hi Barb! It’s in the head notes, a Wilton 1M. About halfway through the post, you’ll see it. If you don’t already have one, I’ve linked to a mail order source. It’s one of my favorite tips and I use it all the time. Thanks for reading! These meringues are gorgeous! So perfect for Valentine’s day. I am so impressed with the rose shape – they look just perfect! These cookies are seriously gorgeous! They remind me of macarons, but they’re even prettier. Thanks for the recipe! They are a lot like macarons! But way easier to make, lol! I do love macarons but these are a lot less work to put together, and seriously yummy too! Thanks for the great feedback, Jac! 😀 😀 😀 Thank you Bea! I’m so glad you like! Me tooo, Consuelo! These were really easy to make and if you can’t get Ghirardelli I think they’d work equally well with any good quality bittersweet or semisweet chocolate. Thanks for the sweet comment, now go study, lol! Wow Allie!! Not only are these beautiful, but they are gluten free too!! Thank you so much for sharing! I love getting your recipes every week! Aw thanks, Ester! Every now and again I have a good gluten free one for ya! 😉 Thanks for reading and for the sweet comment. Hope you’re having a great week! WOW. These look fantastic. Being lactose-intolerant I think I’d be happy with just the raspberry meringue! Hi Allie! Just stopping by from Zainab’s site. Ooooh and how pretty! 😀 I just pinned these. I can only imagine how delicious these must taste. They are just stunning. Perfect centerpieces. I love your site and I am so happy to have discovered it. Hi i am trying your recipe but am in need of some help please :/ how do you keep the pink colour from turning a toasty brown? Even at the lowest temp setting its turning brown 🙁 any advice please? It should not turn brown! What is the lowest setting on your oven? On mine it is 170 degrees F. Be sure the sheet tray is not too close to the heating element. Try to place it directly in the center of your oven. If your oven can’t get to a low enough temperature, try preheating it, then turn it off before you put the meringues in there, and let them sit and dry in the warm oven overnight. Hope that helps! Good luck! Thanks will try that 🙂 and will let you know, however it was a hit everyone enjoyed them.. hope next time they will loook as pretty as yours. Thanks again for the tip. My pleasure, Sabrina! I’m so happy to hear that your guests enjoyed the meringues. Hopefully they won’t turn brown on you next time! But at least they still tasted good. Thanks for reading, dear! Looking forward to making these for a ladies spa night this weekend. I know depending on size, but around how many does this make? Looks delicious. Thank you for sharing! 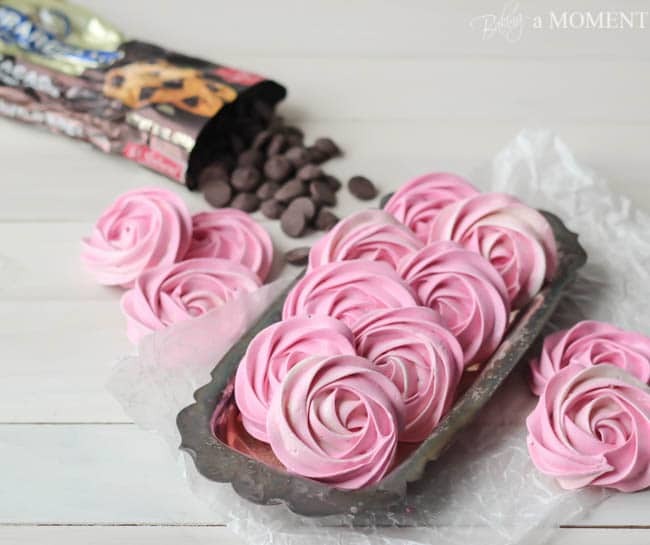 Making these as we speak for Mother’s Day. Just tasted the meringue before I put them in the oven and I about died, SO DELICIOUS! So excited to finish them up!! Im new to baking. Are there any health precautions i should take in storing these? Do you know if I could leave them, put them in the fridge or in the freezer? How long should they last? Thank you! Hey Kylie! Thanks so much for reading. They should last a couple of days in an airtight container. I think if you refrigerated them they might lose that light crisp quality, and become chewy. Nothing to worry about health-wise, but maybe just not as palatable. Good luck and enjoy! I honestly don’t know for sure, but I think it’s certainly worth trying! I would keep it in an airtight container in the fridge just because it’s eggs, you know. And get yourself more than one baking sheet! Lol… I think I have about 10 but of course that’s overkill I’m sure. 😉 Good luck Kait and let me know how you make out, ok? That is so wonderful to hear, Kait! I couldn’t be happier to have inspired you to create. I’m so glad to hear that they turned out ok- that’s so great to know for future reference 😉 And you’re instincts are spot-on, it was a 1M tip! Thank you so much for reading and sharing your experience with me and my readers. Enjoy! I just made these last night and it took them about an hour and a half longer to bake. Some lost the color and all of them are very sticky on the top. What do you recommend to fix this? I’ll be trying another batch soon. Hi Ulrike! Sorry you had such trouble- it sounds to me like you had a lot of humidity in your kitchen last night. The meringues are very senstive to that. If you have a convection setting on your oven, I would definitely recommend using that. I hope that helps! I am having a hard time finding a pink gel food coloring. Can you tell me what brand you used and where you bought it? I have these in the oven at the moment. All is going well so far. Hey Ghirardelli Chic! I just use the gel-paste food coloring by Wilton. The color is “Rose Pink,” and you can get it at craft stores like Michael’s or A.C. Moore. They usually have it at Wal-Mart too. Here’s a link, so you can see what to look for. You only need a little speck on the end of a toothpick, to tint the whole batch. Thanks for reading; hope you enjoy! Hi, I’ve looked through your post and can’t find an idea of approximately how many cookies the recipes makes. Can you please enlighten me? Thanks! Hey Micol! It kinda depends on how large you pipe them but I would think you could get anywhere from 1 1/2 – 2 dozen sandwiches. Thanks for reading and I hope you enjoy! These turned out well. Made them last night. Very dry, perfect. Put the ganache on about 4 hours ago, no they are all soft! Guess needs to be done last minute. Or did I d something wrong? Oh no! Honestly I did not have that experience. Mine stayed dry and crunchy for days. Was your ganache still warm, by chance? Mine was very cool and pretty stiff to pipe. Maybe that could have made the difference? Ahh, theese look so gorgeous! I was wondering if i can replace the jam with frozen raspberries? If I boil them for a minute, smash them and run them through a sieve, making the mass seedless. Would that work? Hey Eline! Thanks for the great question. I definitely think it would work, so long as you’re sure to boil the raspberries long enough to get a lot of the water content out of them. In other words, reduce them down so they’re nice and thick, like a jam would be. I hope that helps! How long do these keep? I want to bake them on Saturday to take to school on Monday. They can keep pretty well for a few days, so long as it’s not too humid and they’re in an airtight container. If you want to make them ahead, I’d recommend making & storing the meringues and ganache separately, then filling just before serving. That way the meringues stay light and crisp without absorbing any moisture from the filling. Good luck! These look wonderful. 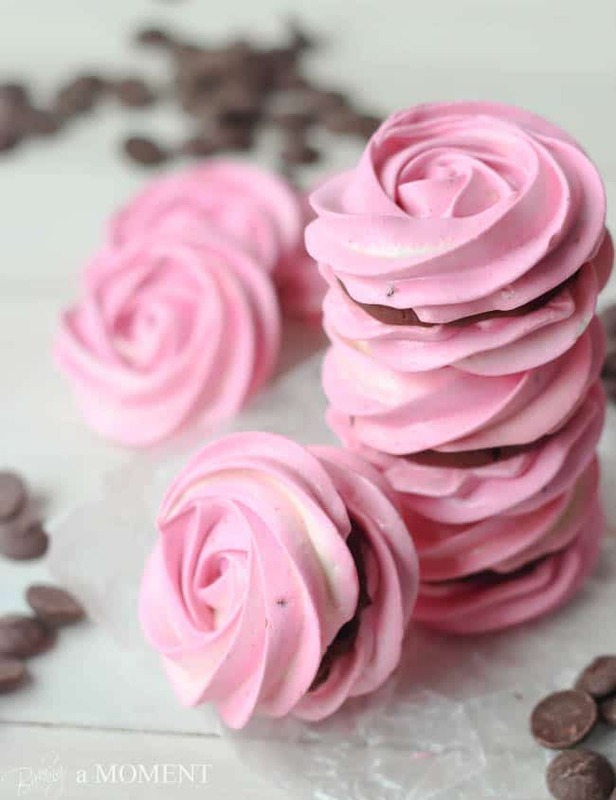 i would like to make ahead for a baby shower….can you freeze the meringues successfully? Yes you can! I would just make sure they’re in an airtight container, any humidity at all will cause them to become chewy. You also would want to freeze them unfilled (so, no chocolate ganache) for the same reason. Otherwise the meringues would absorb moisture from the filling. You can fill them just before serving. I hope that helps! My minimum oven temp is a 100 Celcius. Can i not bake these then? I wouldn’t let it stop you from trying, Sibgha! Just keep it as low as you can and do your best not to let them brown. They should be dry and light. Good luck! i baked these meringues yesterday and they were absolutely divine! they still taste good but if you pick one up, it turns to mush. only the filling has remained the same. i put the cookies in an airtight container and left it on the counter. i’m not sure as to why that has happened. is it the filling? I’ve never made meringues with a filling before, just flavoured ones. i’m super upset because they were supposed to be a gift. i popped them into the fridge but that hasn’t done anything. are they still salvageable? what could have gone wrong? Hey Aisha! I’m so sorry you had difficulty! It’s definitely because of the filling. The moisture from the filling gets into the dry meringue and changes the texture. When I made mine, they got a little chewier on the 2nd-3rd day, I wouldn’t say soft or mushy, just not quite as light and dry. If you prefer the light/dry texture, it’s probably best to wait to fill them until just before serving. Sadly, meringues don’t tend to hold up well for long periods of time. Sorry! Hi, how in advance can these be made? Hey Viktoriya! I wouldn’t do them too far in advance. They tend to pick up moisture from the air and lose their crispness. If you must, you can bake the meringues a day or two ahead, but definitely hold off on filling them until just before serving. Good luck and enjoy! Sooooooo pretty!! Plus raspberry and dark chocolate are perfect together! These are the just SO pretty! These are absolutely beautiful! Almost too pretty to eat! Lemme just say ….. Omg! I just made these… Amazing to say the least. Good. And on top of that it was my first time ever making meringue cookies at all. Thank you for this! I’m so glad they worked out for you Brooke! Thank you so much for the great feedback! Your oven is most definitely too hot. They should not even be browned, let alone burnt. The oven temp should be set to 170 degrees Fahrenheit, not Celsius. 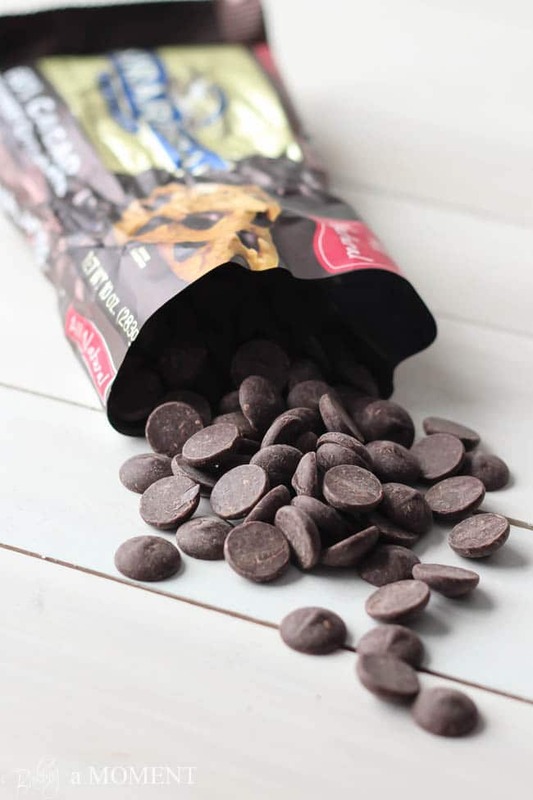 You had me at Dark Chocolate – and they are so pretty, too! I am a dark chocolate lover too Donna! So irresistible… Thanks so much for reading, and for the sweet comment! I just found your blog and have been trying to make these for a friends wedding because I think they’d be perfect! It has been raining non-stop recently so the meringues aren’t turning out quite like I would like. I have to leave them in the oven for a LONG time. But, I’ve found that once they’re done and crispy they’re good to go, but when I add the ganache and store in an airtight container, the meringues get soft. Is that just a product of the humidity? Or did this happen to you at all too? I’m hoping to make these a day in advance for the wedding. Otherwise, they taste DELICIOUS!! Hey Christine! It sure has been a wet September where I live too. I just made a big batch of meringue kisses a couple of weeks ago for my niece’s birthday party, and I had SO much trouble with this too. I thought I could bake them ahead but no such luck. After about an hour out of the oven they started getting sticky and gooey. Meringues just really love to pick up moisture from the air. Unless it’s a really dry day, I’m afraid this is something you’re going to unfortunately have to contend with! These look absolutely stunning and I’m sure they taste just as amazing. I’m always looking to expand my baking skills and I’ve never made meringue cookies. This will be a great recipe to learn a new skill. I can’t wait to try them! That’s terrific Colleen! I always enjoy new challenges too. Hope you have the best of luck with this recipe! Would jelly work instead of jam? Might be harder to get it to combine with the whites, but go ahead and give it a try!